I backed the MeArm Pi kickstarter project earlier this year, and just received the finished product. It’s a, laser cut, plastic robot arm which has a built-in Raspberry Pi. It is created by Mime Industries who have previously created a similar robot arm without the build-in controller / Raspberry Pi. It can be controlled using built-in joysticks or through programming via a choice of languages. The MeArm Pi kit comes well packaged. My version included a Pi Zero with pre-installed SD card, although with some models you need to provide your own Raspberry Pi. It also came with a separate power supply. Opening the box and all the parts were laid out with an excellent instruction sheet complete with pictures for every step of the assembly. Assembly was mostly straight forward using the supplied allen key. It was a little wary at first as the screws do take some screwing in and I didn’t want to break the plastic, but went okay. The one part that was fiddly is the claw module which needed a bit of fiddling to get the bits in the right place. I also needed a screwdriver at this point as the screw on the servo motor was protruding a little. The Raspberry Pi is mounted within the controller at the back of the arm. When connected and powered on you first need to wait for a short while for the Raspberry Pi to boot. It should then be possible to use the two built-in joysticks to control the arm. I found that most of this worked straight away, it could move left and right, the arm could tilt up and down and the claws could be opened and closed, but there was a problem with the main forward and backwards movement. I followed the troubleshooting advice which was mainly about the screws not being too loose, or too tight (a bit uncertain at first exactly what is correct but you do get a feel for it later). Which didn’t fix the problem. It was after I looked at the web interface that I realised that the servo was moving correctly, but that the small arm on the end of the servo was in the wrong position. I therefore removed the servo, and repositioned the arm using a screwdriver. This did have to be a certain servo which was marked with the white dot. I expect this was just a one off where the servo was not correctly positioned prior to shipping. Once I realised what was wrong it was an easy fix in the end. The MeArm Pi SD card image includes a WiFi hotspot and built-in web server. This means that you can connect to the Raspberry Pi straight away without needing to connect a screen or keyboard. If you do need to connect up a screen for any reason then with the Pi Zero at least it does mean a reasonable amount of disassembly, but hopefully that won’t be required. 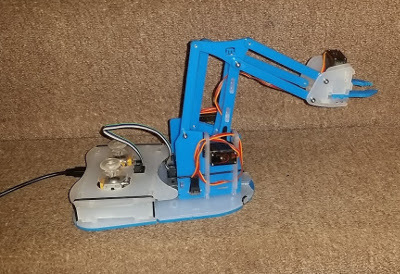 The MeArm Pi uses fservo motors which are controlled using degrees of motion which makes positioning the arm using programming easy and more reliable than normal DC motors. One thing to be aware of is that the Raspberry Pi has ssh enabled without default passwords. It is good to have the ability to ssh onto the Raspberry Pi controlling the robot arm, but please ensure you change the password when you first use it. 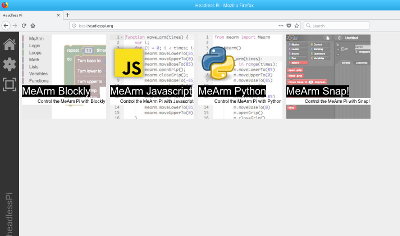 How does the MeArm compare? There are other robot arms available, but this is the first I’ve seen with a Raspberry Pi built-in to the robot arm. The one I have to compare with is the Cebek robot arm available from CPC and Maplin. The Cebek robot arm is moulded plastic which gives more substantial parts. The Cebek robot also has an additional motor which gives it more control on positioning of the arm. Where the Cebek does not match up so well is that the motors are very difficult to control with no feedback of the position of the motors. The Cebek arm is controlled using a USB, but only includes Windows software with limited programming ability, although I have written my own Graphical application for controlling the Cebek Robot Arm for the Raspberry Pi / Linux. Whilst each of the robot arms has their own good and bad points the built-in programming of the MeArm Pi makes it far more appropriate to learn programming, and the use of Servo motors makes it easier to use. So I think the MeArm Pi is the better for most people. 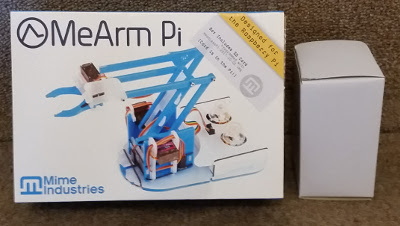 As a device to help teach programming, the MeArm Pi is an excellent robot arm. It is a little fiddly to put together and I had a couple of little issues with mine, but the programming environment is excellent. Having the ability to control it using both the joysticks and through programming should mean that this is easy to get started with. This entry was posted on Thursday, November 30th, 2017 and is filed under Computers, Electronics, Programming, RaspberryPi. You can follow any responses to this entry through the RSS 2.0 feed. Both comments and pings are currently closed.